According to WHO’s 2011 World Report on Disability, 1 billion people with disabilities around the world are among the most marginalized and underserved individuals. They are excluded from education, health, and social services, which holds them back from achieving their full potential. To address this concern, Catholic Relief Services (CRS) and Special Olympics Kenya implemented a three-year inclusive early childhood development (ECD) initiative in the slums of Nairobi, Kenya, supporting 365 children with intellectual disabilities (ages 0-10) and their caregivers. CRS contributes its global experience in implementing ECD programs, while Special Olympics brings their expertise in supporting people with intellectual disabilities through sport and health services. 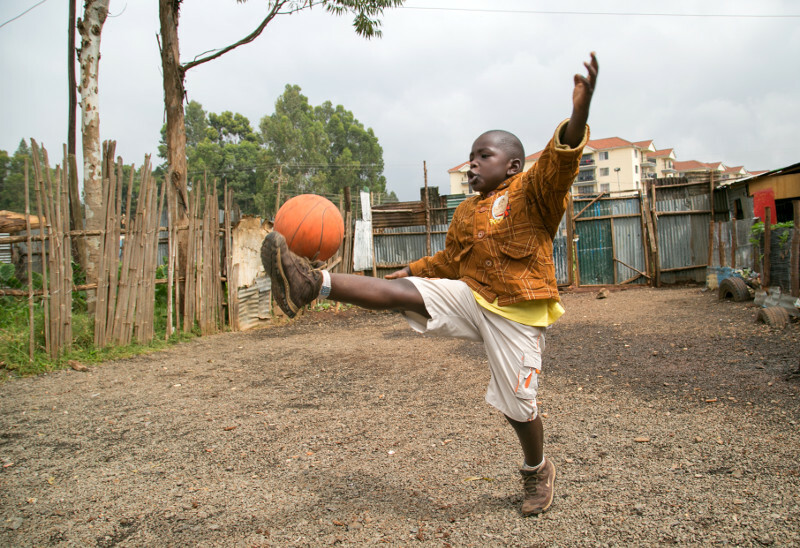 This pilot partnership in Nairobi, the Intellectual Disability Empowerment Agenda (IDEA), is the first for the two organizations to combine ECD services with inclusive play. The IDEA project, with the collaboration of community health volunteers, social workers, physiotherapists, and Special Olympics staff, builds children’s social, physical, and cognitive skills through inclusive therapeutic play activities. The play sessions, based on the Special Olympics’ Young Athletes model, are implemented at ECD centers. Weekly sessions at the ECD centers and monthly home visits help caregivers of children with intellectual disabilities learn about parenting, hygiene and sanitation, and nutrition to support their child’s development. Adults with intellectual disabilities provide additional support to children and their families on discipline techniques, toy-making, modeling play relationships between caregiver and child, and social skills. The following story of Quincy Ohuoch illustrates the power of IDEA and how it is positively changing life for Quincy, his family, and his community. 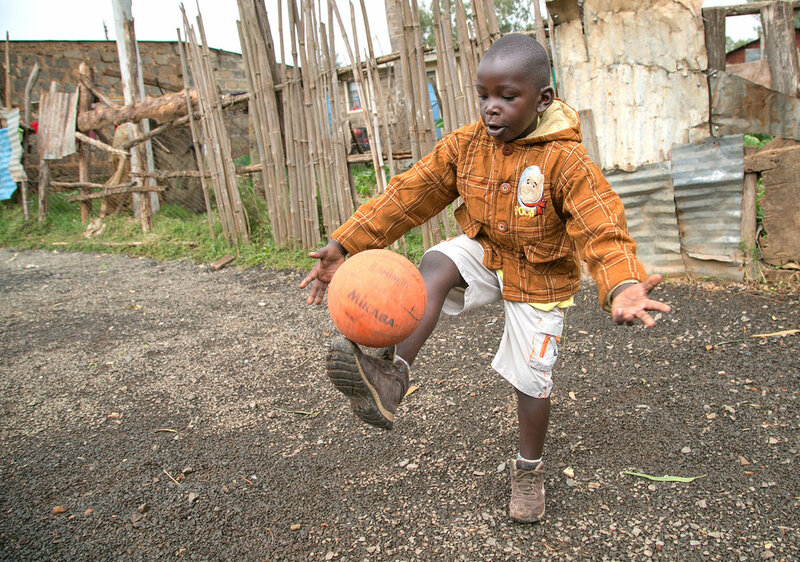 Five-year-old Quincy Ohuoch has made tremendous strides, both physically and socially, since joining IDEA. “I have seen a lot of change with Quincy, especially that now he can talk,” says Ruth, Quincy’s mother. The services offered at ECD days, ranging from positive parenting training to interactive play therapy, have provided Quincy the opportunity to grow and thrive. Ruth first learned of the IDEA project through a friend, who invited her to join. At weekly ECD days, Quincy joins play therapy while Ruth attends a parent support group. “I get to help other parents and experience what they go through with their kids. We exchange ideas and listen to each other, and support each other.” Through play therapy with children with and without intellectual disabilities, Quincy has developed social skills while meeting physical milestones. Before joining IDEA, Quincy was disengaged from other children and preferred to play by himself. “But now, he knows play is for all children. He knows how to share his toys and he wants to play with all kids,” says Ruth. One of the biggest facilitators of Quincy’s play has been his speech development. He has learned to verbally communicate wants and needs, allowing him to express his desire to play. Through positive parenting sessions during home visits by a Community Health Volunteer (CHV), Ruth has learned the importance of play for Quincy’s development, how to play with her child, and how to make toys from existing household materials. At home, Quincy continues to make tremendous strides. Prior to joining the IDEA project, he was not toilet trained. “When he started, he can just be silent and you will even find that he has soiled himself and is still silent,” says Ruth. “The relationship is good because in the house, if he needs anything—like the potty—he can just come to me and say ‘potty.’ In fact, now he knows where the potty is and can just go himself,” says Quincy’s aunt, who usually brings him to ECD days while Ruth works. This new independence and adoption of healthy behaviors has greatly increased the quality of life for Quincy and his family members. Quincy has also learned to feed himself and request water when he’s thirsty, which puts his caregivers at ease. Positive parenting education has improved Quincy’s behavior at home. In the past, Quincy easily became hyperactive and disruptive. “He used to throw things around. Before I understood Quincy, I would beat him thoroughly. I never used to understand his condition but slowly I’ve come to understand. I no longer beat him. I love him and I know what he wants. I understand him more,” says Ruth. During positive parenting sessions at the ECD center and during home visits, she has learned how to understand Quincy’s behavior, positively manage his behavior, and use appropriate discipline techniques. The community has also grown to accept children like Quincy and their families. “CHVs usually go out there in the community to talk to parents and neighbors. There are people in African culture who think children with disabilities are bewitched or cursed. But now, they are informed and can accept and embrace these children because they now know it’s not witchcraft. So now children with disabilities are accepted in the community because people are more informed than they were before,” says Vidah, a teacher at the ECD center. “Now they have understood him; they even welcome him to their house and give him something to eat. Relationships between Quincy and the neighbors have really improved. They now appreciate him—they love him. He even has more friends than me!” says Ruth. As demonstrated by Quincy’s story, inclusive ECD programs like IDEA provide children with intellectual disabilities in developing nations the opportunity to develop socially, physically, and cognitively. The gains extend beyond the individual child to their caregivers and communities. This pilot effort in Nairobi shows promising results as a model for extending ECD services to children with intellectual disabilities, benefiting both child development and social inclusion in an urban environment.